The official grand opening for the new West Abbotsford townhouse project by Polygon is in late January 2015! Priced from an affordable presales pricing of only $269,900, the master planned Polygon Westerleigh community introduces the Brighton Abbotsford townhome project. Featuring both 2 and 3 bedroom floor plans priced from the mid $200’s, these Tudor style homes with steeply pitched rooflines, stately brick cladding and window boxes are not only affordable, but really unique. The project site location is at 30989 Westridge Place Abbotsford and the homes will feature everything from open plan layouts to large windows allowing lots of natural light into your new home. Inside, the modern interiors will include gourmet kitchens with stainless steel appliance package, quartz stone counters and even powder rooms on the main floor in select layouts for convenience. As well, there are private decks that expand your living space outside in addition to attached garages that add convenience and storage. The exciting and ever growing West Abbotsford neighbourhood is one of the most liveable locations east of Vancouver. The Abbotsford Brighton Townhomes at Westerleigh will be literally minutes away from higher education, top ranked schools, indoor/outdoor recreation and urban amenities/services. In addition, the Westerleigh Abbotsford community also features an on-site amenities centre called Club West which includes a private clubhouse lounge with a fitness gym, outdoor pool, fireside lounge, hockey room, movie theatre and much more. Residents at the Brighton Abbotsford townhomes will have exclusive access to this private amenity centre at Club West at Westerleigh which is over 8,400 square feet in size. 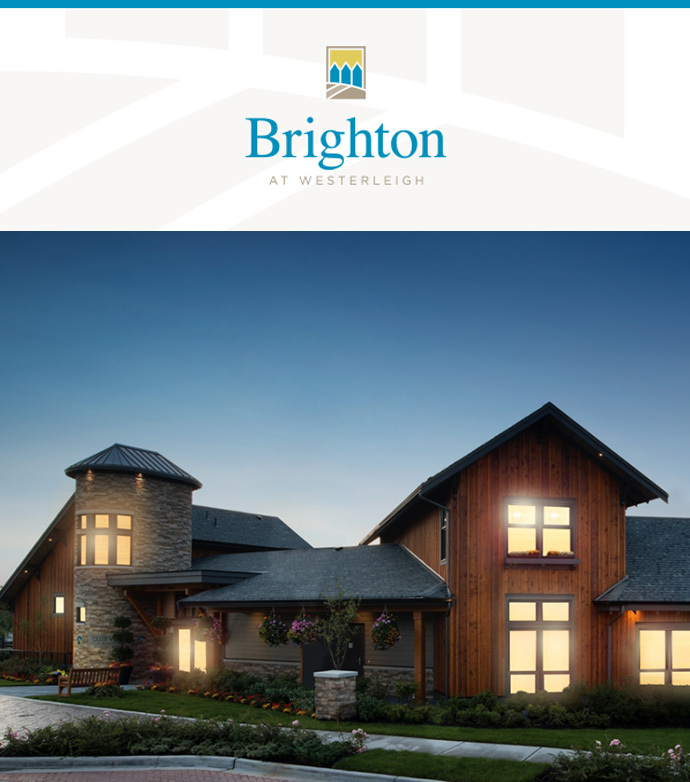 For more information about Polygon’s Brighton at Westerleigh Abbotsford, please visit www.polyhomes.com for all the details. Here’s more info regarding the exciting new West Abbotsford townhome project by Polygon. The Brighton at Westerleigh townhomes will feature Tudor style architecture designed by award winning Formwerks Architectural, which creates a unique and intriguing façade to this neighbourhood. The homes will feature airy nine foot ceiling heights on the main floor as well as Gray Oak or Dark Walnut wood laminate floors in the entry area. All of the new Brighton Abbotsford townhomes will feature generous outdoor living spaces in the form of patios or decks in addition to fenced and private yards which is great for families and dog owners. Some ho9mes also have welcoming front yards and individual entry gates with picket fences for that truly traditional Tudor style look and feel. Many of the homes will have main floor powder rooms and some of the bathroom features include such things as spacious walk in shower with glass doors, double vanities (with porcelain sinks), dual flush toilet by American Standard, convenient storage nook in some floor plans, full length vanity mirror and cosmetic light bar. In addition, the kitchens at the new West Abbotsford Brighton Townhomes at Westerleigh will feature custom crafted and contemporary flat planel cabinets in White or Teak with modern pulls in addition to polished quartz counters with full height imported ceramic tiled backsplashes. The added convenience of front and rear hose bibs for gardening and washing is a great feature as are the wood privacy screens between decks and patios. Other great features include vertical blinds on sliding doors and horizontal blinds on windows, closet shelving and Polygon New Generation Design with rain screen protection. All homes have the Comprehensive Travelers Insurance Company of Canada insurance as well as access to Club West at Westerleigh. Some of the optional upgrades at the Westerleigh Brighton Abbotsford townhomes include stacked washer/dryer, microwave with designer trim kit, warm wood laminate floors in living and dining rooms in select floor plans and upgrades to counter depth stainless steel fridge with bottom mount freezer. The Brighton townhomes will feature 9 foot ceilings on the main floor in addition to beautiful laminate wood floors in the entries. The living/dining rooms, hallways and bedrooms feature plush 35 oz carpets by Beauleiu (can be upgraded) and the main floor in select homes will have warm wood laminate floors. The homes will feature low-E glass windows, two designer selected palettes called Dark and Light in addition to individually controlled thermostats and electric baseboard heating. The beautiful bathrooms at the West Abbotsford Brighton Townhomes at Westerleigh community will feature an ensuite bathroom with spacious walk in shower, double his and hers porcelain sinks, convenient storage, full length vanity mirror and cosmetic bar light. The main bathrooms feature a bath tub with ceramic tiled surrounds, porcelain sink, dual flush toilets and vanity lights. There is custom designer flat panel laminate cabinetry in either Teak or White finish with polished chrome pulls in addition to designer laminate counters with integral backsplash. The gourmet kitchens at the new Polygon Westerleigh Townhomes at Brighton Abbotsford introduces a sleek stainless steel Frigidaire appliance package including an 18 cubic foot Energy Star auto defrost top mount fridge/freezer, 24” Energy Star dishwasher and electronic range, and a 30” wide slide in electric range. The kitchens also have a Broan hood fan with light, dual stainless steel sinks with single lever faucet and pull out vegetable spray by Grohe in addition to space saving design elements such as a microwave shelf, corner lazy susan, recycling bins, pantry and kitchen islands (features listed depend on floorplan). 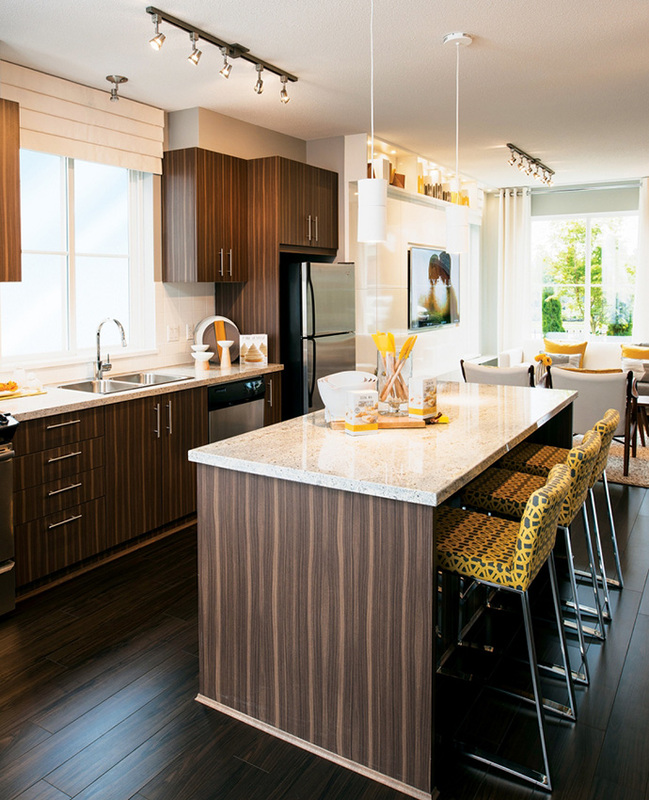 As well, the gourmet kitchens at the Brighton Abbotsford Townhomes include contemporary custom crafted flat panel laminate cabinets in White or Teak with modern pulls, attractive and durable wood laminate floors and polished quartz countesr with full height imported ceramic tiled backspash.